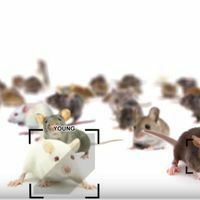 Researchers use chemicals to manipulate the behavior of mice. 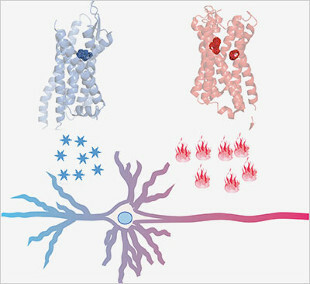 New DREADDs achieves bidirectional control of a neuron by introducing a receptor protein and matching chemical for increasing neuronal activity (red) and another set for reducing activity (blue). BRYAN ROTH, UNIVERSITY OF NORTH CAROLINAA novel chemical tool allows researchers to turn neurons on and off in live mice, with effects that last up to an hour—far longer than the milliseconds of activity elicited by optogenetics technologies. 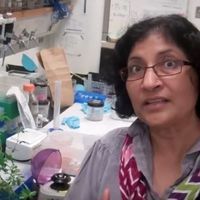 A team from the University of North Carolina, Chapel Hill (UNC), and the National Institutes of Health (NIH) used the new technique to control the hunger and activity levels of mice. The results were published last week (April 30) in Neuron. The technique involves genetically altering neurons to carry “designer receptors exclusively activated by a designer drug,” or DREADDs, which fire in response to certain synthetic chemicals, then providing those molecules when neural activity in the region is desired. While DREADDs have been around for the better part of a decade, typically an individual neuron would carry just one receptor type, allowing it to be turned on or off, but not both. 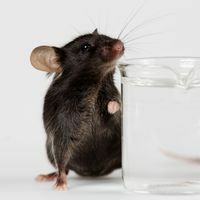 In the new study, researchers engineered the mice to have neurons that carry two receptors with opposing effects, so the activity could be manipulated in either direction—to make a mouse feel hungry or satiated, for example. 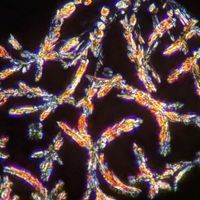 “With its new push-pull control, this tool sharpens the cutting edge of research aimed at improving our understanding of brain circuit disorders, such as schizophrenia and addictive behaviors,” said NIH Director Francis Collins said in a statement.